The report into the Charleton Tribunal was published yesterday and it didn’t hold back. The Tribunal was tasked with looking into allegations that there had been a smear campaign against Sergeant Maurice McCabe, orchestrated by senior gardaí. In its report, it found that it was “convinced” there was a “campaign of calumny” by former Garda Commissioner Martin Callinan against McCabe. You can read all our in-depth coverage here. The head of the Garda Press Office at the time was Superintendent Dave Taylor who had claimed he was ordered to negatively brief a number of journalists about McCabe. But the testimony of journalists in this Tribunal were to be crucial – navigating the questions so as to protect their sources ever more troublesome. Charleton was tasked with getting information from those who pride themselves and whose careers rest on not revealing their sources. He had to speak to a number of journalists during the Tribunal. Many of the journalists who gave evidence, including RTÉ’s Paul Reynolds, were vindicated by Charleton’s findings. Journalistic privilege was cited by many – not by all – but by most when the Tribunal’s questioning veered towards from where they got their information. And the right honourable Justice Peter Charleton was none too plussed with the wall of journalistic privilege he kept banging his head off. This was a Tribunal where the inner workings of the media were put under the spotlight and how the often grimy world of spin and bluster manage to bleed their way into our news. The doublespeak of Garda PR was also skewered by Charleton. The ebullient justice quoted Shakespeare’s Macbeth to describe how you can’t ascertain right from wrong by the look of the person talking to you. He bemoaned the double-talk and the “flurry of emails, memoranda, communications at high level, drafts, counter drafts and final drafts about the Garda Commissioner’s approach”. Like Macbeth, he didn’t know if fair was foul or foul was fair. His disdain for the constant fork-tongued statements was also a cause of constant frustration for the judge and his team – so much so that he described the descent of our public discourse into the language of spin as a “hideous development”. But first to be tackled was how reporters used their journalistic privilege to withhold where they received their information. Charleton took aim at the fourth estate’s propensity to cite privilege when it didn’t suit them. “The Tribunal had the greatest difficulty in getting any information from journalists. From March 2017, the Tribunal was writing to journalists and specifically targeted journalists who were noted as contacts on Superintendent David Taylor’s mobile devices. “He waived privilege. Journalistic privilege has two parts, the entitlement to assert it and the right of society to override it in the interests of a pressing national concern. It took over a year of work to come to the point where journalists could be called to, in the end, testify that they had never been negatively briefed by Superintendent David Taylor or to claim that they alone possessed the privilege of not answering questions. What did Superintendent Taylor do? That was the question which the people of Ireland entrusted this Tribunal to find out. With regards to specific journalists, Charleton took aim at the Irish Examiner and accused the newspaper of frustrating the work of the Tribunal. 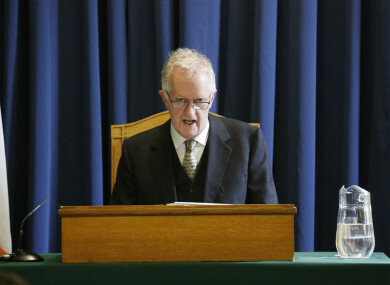 His judgement explained: “The Tribunal, while grateful to those journalists who eventually cooperated with it, regards the delay in providing that cooperation as regrettable and as a frustration of the public will, as expressed by the terms of reference set by the Oireachtas, that a Tribunal of enquiry should do its work quickly. Ultimately three journalists from the Irish Examiner, Cormac O’Keeffe, Juno McEnroe and Daniel McConnell, refused to give evidence to the Tribunal about the content of their dealings with Superintendent Taylor. This, obviously, and without justification, frustrated the work of the Tribunal. Ultimately, Charleton’s quest to sift through thousands of pages of testimony and evidence was definitely hindered by members of the press claiming privilege but the importance of the press’s right to use it should not be disregarded. Charleton’s eventual conclusion that there was a “campaign of calumny” by former Garda Commissioner Martin Callinan against Maurice McCabe was unequivocal and the direct antithesis of the fork-tongued double speak he criticised earlier on in his report. Email “Peter Charleton wasn't overly enamoured by the press - here's what he had to say about journalists”. Feedback on “Peter Charleton wasn't overly enamoured by the press - here's what he had to say about journalists”.